Bannon, Corker, Trump on Disrespect, obstruction of justice and impeachment, the art of the tantrum. Nine months after the publication of an explosive and salacious dossier detailing allegations of collusion between President Donald Trump and Russia, its claims—though largely unverified and vehemently denied by those involved—are the subject of intense scrutiny. According to reports in recent days, not only has the investigation of the document been turned over to the man leading the Trump-Russia probe, but Special Counsel Robert Mueller’s team recently met with Steele.. Trump may have called it “totally made-up facts by sleazebag political operatives,” but it is clear it is not going anywhere anytime soon, and continue to plays an important role in the wider investigation into allegations concerning Russia’s interference in the 2016 election. Donald Trump congratulated himself on his trip to hurricane savaged Puerto Rico by celebrating the “incredible” cheering of the “crowd of a lot of people” as he threw rolls of paper at them. He recounted it as a fun generating sporting event. Trump was widely condemned for not showing empathy for the ongoing suffering in Puerto Rico and making the trip a spectacle. 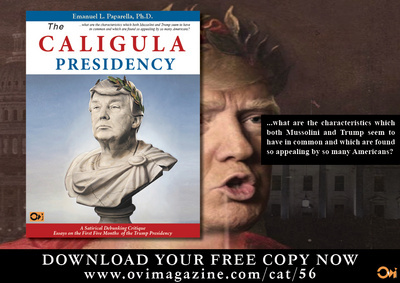 Those raving comments should leave little doubt in anybody’s mind that what we presently have in the WH is a Caligula-style lunatic. Senator Corker has said publicly that Donald Trump could put the U.S. “on the path to World War III” because he treats the presidency “like he’s doing The Apprentice or something.” That comment capped a week of insults he traded with Trump by saying he knows “for a fact that every single day at the White House, it’s a situation of trying to contain” the president. Corker’s comments followed a press conference where Tillerson dismissed an NBC News report that he called Trump a "moron". Trump has repeatedly repeatedly undercut Tillerson’s foreign policy positions, tweeting 1 that the secretary of state “is wasting his time trying to negotiate with” North Korea. Corker has said in a tweet that “It's a shame the White House has become an adult day care center. Corker was an early mainstream Republican supporter of Trump but has more and more sharply criticized the president’s behaviour in recent months, especially since the events in Charlottesville. Former White House chief strategist Steve Bannon called on Sen. Bob Corker to “resign immediately” after the Tennessee Republican’s attack against President Trump. In an interview with The New York Times Corker has said he was concerned Trump’s volatility could result in World War III and said he believed the president had “hurt” the country at times with his online Twitter tirades. Such opinions, the senator continued, were shared by the “vast majority” of congressional Republicans. The Brookings Institution, a research group and public policy organization has charged that Trump obstructed justice when he got in the way of investigations into Russian interference in the presidential election by trying to persuade FBI Director James Comey to drop the bureau's probe and then firing him. "The public record contains substantial evidence that President Trump attempted to impede the investigations of Michael Flynn and Russian interference in the 2016 presidential election, including by firing FBI Director James Comey. There is also a question as to whether President Trump conspired to obstruct justice with senior members of his administration although the public facts regarding conspiracy are less well-developed." In a paper titled “Presidential Obstruction of Justice: The Case of Donald J. Trump,” Brookings researchers write that attempting to stop an investigation, "demanding the loyalty" of someone involved, requesting their help in ending the investigation, and then firing that person are acts "that have frequently resulted in obstruction convictions." Trump expressing "hope" that Comey would stop the investigation, as the former director testified, could be enough to prove that he fired him for the wrong reasons. The authors of the study note that impeachment discussions are "premature" before the end of the investigation. Representative Steve Cohen (D-Tenn.) is filing articles of impeachment claiming that Trump failed the “presidential test of moral leadership following white nationalist violence in Charlottesville, Virginia, this summer by failing to condemn the groups involved. Cohen delayed bringing his articles to the floor because of several natural disasters across the nation and the mass shooting in Las Vegas but plans to move the articles forward this month. But the Constitution's principles for impeachment are intentionally vague. The accusers don’t necessarily have to prove criminal wrongdoing, and they don’t necessarily have to prove criminal intent. House members would have to prove that Trump damaged the nation and that he was guilty of “high crimes and misdemeanors,” which does not actually mean criminal misconduct. The latest account of the White House comes from Robert Costa and Philip Rucker at the Washington Post. It portrays an isolated, frustrated, and rage-prone president. His staff are dismayed with his tweets. He is increasingly prone to “dark moods” (a phrase that is alarmingly recurrent in profiles of the most powerful man on earth). He wants to do more of the things that make him happy, like talking to outsiders and holding rallies — things that are, notably, not part of the job of being a first-year president, and that can in fact get in the way of accomplishing an agenda yet he’s already making references to being in the office for seven more years. Reporters are acknowledging that when Trump blows up at people, it’s not the symptom of a permanent dissatisfaction with them — it’s a way of blowing off steam, or a temporary irritant he’ll soon forget about. In other words, Trump makes his anger other people’s problem; he doesn’t actually grapple with it himself. Donald Trump gets to treat everyone around him, from his aides to the press to the people targeted by his policies, as his own personal punching bag because he’s never been confronted with anyone more powerful than he is who punches back. It’s a behavior pattern that most people are forced to mature out of. Because most people, at some point in their lives, suffer the consequences of their actions. So far, Donald Trump has not. Most people find other ways to cope with frustration, because they are punished in life if they don’t. One Trump confidant likened the president to a whistling teapot, saying that when he does not blow off steam, he can turn into a pressure cooker and explode. "I think we are in pressure cooker territory," said this person. The fact that Donald Trump goes through his days continuing to expect that his expressions of anger will harmlessly evaporate into the ether is all you need to know about his previous 71 years of life. If he’d ever had to live with the consequences of his actions, he would have learned that he didn’t like where that behavior got him. Instead, he has turned consequences into another set of rules he gleefully evades — another thing to make everyone’s problem but his own. He allows his companies to go bankrupt, but never himself. He brags with impunity about assaulting women but can shrug it off as “locker room talk.” He feels no need to honor his own agreements with contractors or alliances with senators, because when he forgets he ever cared about something, he expects them to do so too. Most people learn that bottling up anger can sometimes be a good thing — if it’s a superficial enough frustration that the anger will evaporate even if the problem isn’t fixed, it’s usually not worth the trouble to express the anger in the moment. Trump has not learned this, which suggests that for him, it’s never caused enough trouble to worry about. His inability to deal with even a modicum of control over his behavior suggests that, for decades, his feelings have been everyone’s problem but his own. One can only conclude that the 27 psychiatrist that wrote a book declaring Trump a “clear and present danger” have it on target: we have a psychotic personality in charge of nuclear weapons. That ought to be a sobering thought for all those who continue to abet the clear and present danger.